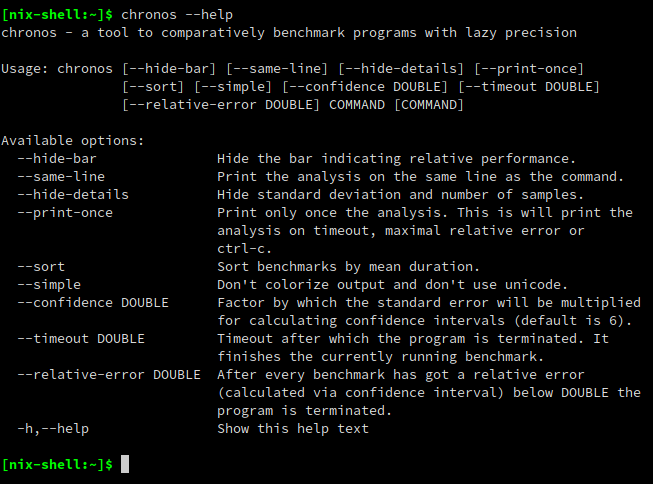 chronos-bench: Benchmarking tool with focus on comparing results. This tool performs lazy benchmarking of functions and shell commands with continuous feedback and improving precision. chronos performs lazy benchmarking of shell commands with continuous feedback and improving precision. chronos will benchmark the specified commands until you abort it with ctrl-c or it reaches some termination criterion specified by the command line. It updates every iteration the measurements of the benchmarks so you can terminate it when you're satisfied with the presented precision. It will intersperse all benchmarks for fastest possible overview and to distribute any external load over all benchmarks to improve precision. chronos presents rich command line options. Normally, the output of --bash-completion-script should be coppied in the appropriate directory. You can use chronos as a haskell library to benchmark pure or impure functions or shell commands. [ benchShell "sleep is slow"  "sleep 0"
, benchShell "echo is fast"   "echo"
, benchShell "true is faster" "true"